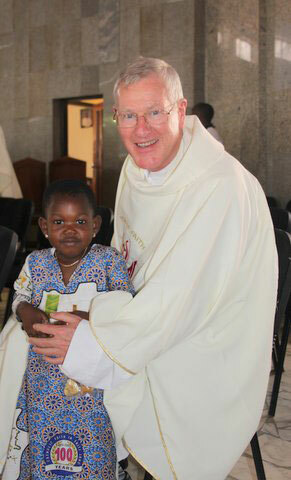 Fr Des Corrigan recently returned from the concluding ceremonies marking the coming the Catholic Faith to Ekitiland in western Nigeria. There was much to celebrate and the Catholics of Ekiti put on a memorable and joyful celebration. Fr Corrigan witnessed, not for the first time, the way Nigerians celebrate and give thanks to God for His blessings. “When it comes to celebrating significant events no effort or expense is spared”, he states. Here is an edited version of his article. 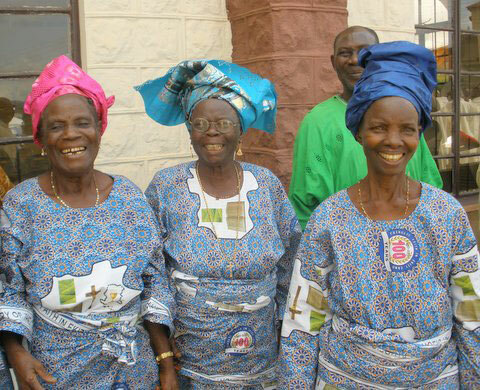 The people of Ekiti diocese were celebrating the centenary of the planting of a small seed in 1913. That year five young men left Usi-Ekiti and travelled to Ibadan to ask Fr. 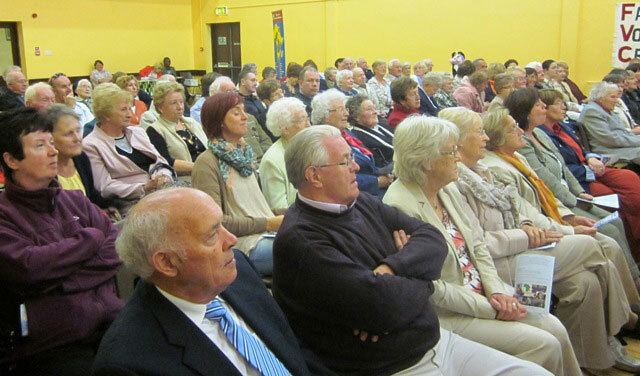 Louis Friess (a French SMA priest) to come to Usi to tell the people about the Catholic Faith. Fr. Friess accepted their invitation and, accompanied by these young, men travelled by train to Offa (now in Kwara State). They walked the rest of the journey to Usi-Ekiti. In their wildest dreams they could never have imagined or even hoped how the seed of the Gospel they planted would grow and blossom over the next 100 years. There have been many events over the past year celebrating that growth but the Grand Finale was a Mass in St. Patrick’s Cathedral, Ado-Ekiti on 19th Oct. 2013. It was a very colourful, joyful occasion with the majority of people dressed in a beautiful specially designed aso ebe (cloth for special occasions) while the bishops and priests wore chasubles designed for the centenary. The cathedral was packed as were the seats under canopies and in a nearby hall. 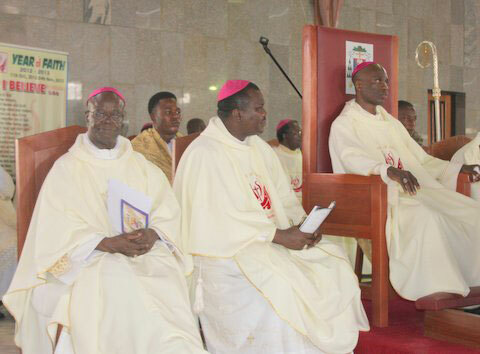 The Papal Nuncio (Archbishop Augustine Kasujja), Cardinal John Onaiyekan of Abuja, about 20 bishops and over 200 priests concelebrated the Mass. The Bishop of Ekiti, Rt Rev Felix Ajakaye, was the principal celebrant. Hundreds of Religious and thousands of the lay faithful participated with an obvious sense of joy, gratitude, pride and satisfaction. Two state governors along with the Speaker of the Federal House of Representatives, Mr Aminu Waziri Tambuwal, were joined by many civic leaders and traditional rulers. The bishops and the guests were accommodated in the Ekiti diocesean pastoral centre which has 75 en-suite rooms. On the previous evening Bishop Ajakaye hosted a big celebratory dinner for invited guests. 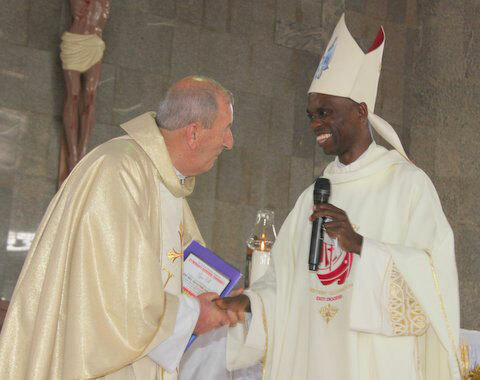 Our photo shows him greeting Fr Eddie Hartnett SMA who has been a missionary in the Archdicoese of Lagos for 46 years. Having worked for nearly 9 years in Ekiti after I first went to Nigeria I was very happy to be present for these celebrations and to represent the SMA Irish Province. I was conscious of the many SMAs who gave long and dedicated service in that area. Earlier in the week there was a Mass in St Patrick’s Cathedral remembering all the deceased missionaries, priests, religious and catechists who had laboured in the Lord’s vineyard in Ekiti. Fr. 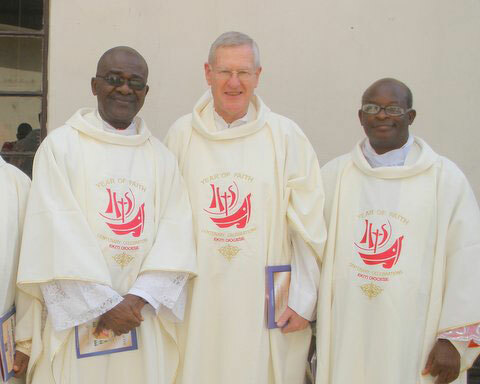 Reginald Nwuchukwu, SMA, (Bight of Benin DF Superior) and Fr. Eddie Hartnett SMA, who is ministering in the Badagry area, were also present flying the SMA flag. Bishop Ajakaye and Cardinal Onaiyekan, in his homily, paid tribute to the SMA missionaries who brought the Faith to Ekitiland. However, it struck me that the memory of SMA in Ekiti and in many such places where we worked in the past, but are no longer physically present, is fading fast. Generations of priests and laity are growing up who know little or nothing of the SMA. We need to find ways of keeping that memory alive and harvesting the fruits of it. Having an SMA presence at events like this is one way but we need to explore others before a rich history, tradition and connection with local churches are lost. It seems very appropriate that in the year of Faith the people of Ekiti celebrated 100 years of the Faith in their land. What struck me most forcibly was the extraordinary growth of the seed of Faith planted 100 years ago by the early SMA missionaries. In the early years the growth was slow but the SMA priests persevered, despite the hardships and setbacks. Our pictures above and below show the immense growth in the Catholic faith in Nigeria – packed churches, local vocations – Cardinals, bishops, priests, sisters and Brothers. And all this work is supplemented by the trojan witness of thousands of lay catechists. For the first 20 years Ado-Ekiti was the only parish and resident mission so the priests and catechists trekked from there all over Ekiti. In the mid to late 1930s Efon, Usi and Ilawe became parishes with priests living there. It was 1946 before the first priest from Ekiti, Anthony Oguntuyi, was ordained. Ekiti, Ondo and Ilorin became a Vicariate in 1943 and in 1948 it became a diocese under Bishop Thomas Hughes SMA (from Hollymount, Co Mayo). He was succeeded by Bishop William Field SMA in 1958. Bishop Ajakaye (right) is joined by the first bishop of Ekiti, Rt Rev Michael Olatuji Fagun (on left) and Bishop Badejo of Oyo diocese (centre). It was during Bishop Field’s time that Ekiti became a separate diocese in July 1972. 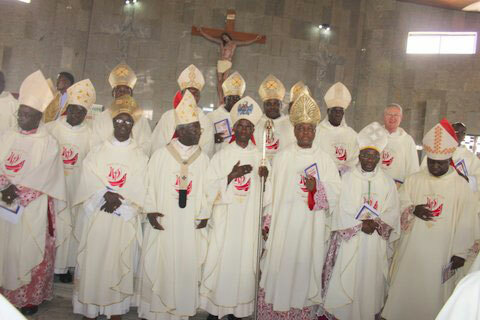 I was fortunate to be there at that time and to be part of the new diocese under Bishop Michael Olatunji Fagun. I was in the Cathedral parish in Ado-Ekiti and, since Bishop Fagun had no bishop’s house, we lived together in the Mission House for 3 years. I found it an enriching experience living and working with Bishop Fagun and learned a lot from him. While I was there for the Centenary celebrations we reminisced about the beginnings of the diocese just over 40 years ago. Some facts may highlight the growth since then. Many new churches have been built and old ones replaced by larger ones. Places that were small outstations are now parishes with resident priests. 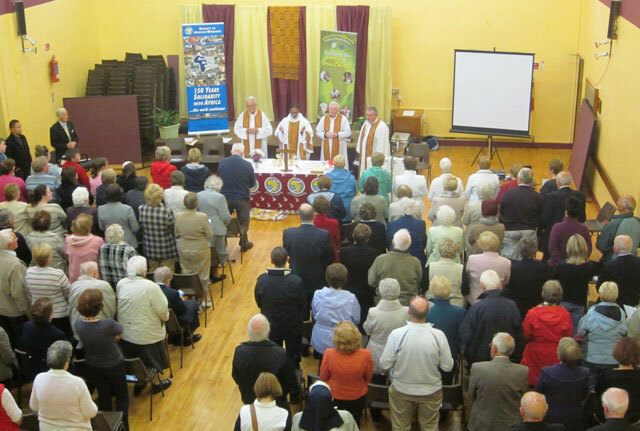 The people are very generous and are supporting all those priests and parishes so the growth is sustainable. The growth in the number of parishes and churches indicates the increase in the number of faithful filling those churches every Sunday. Bishop Fagun told me that the Cathedral parish where I and others worked in the 1970s has grown and been divided so often that it is now 16 parishes, served by 22 priests. In Ado-Ekiti town alone there are 8 parishes. I think that story of the growth and development of the Faith in Ekiti is typical of most parts of Nigeria and indeed of Africa. The church in Ekiti is vibrant, strong, full of life and energy and still growing and developing. It should be able to deal with the issues and challenges it will face in the next 100 years. As I looked at the smiling, joyful faces of the people in the cathedral in Ado-Ekiti as we came towards the end of a 4 hour ceremony I thought we in the SMA can learn something from them. They came to give thanks to God for the growth of the Faith among them over the last 100 years and to rejoice in His blessings. As we look back I think we too can and should have a great sense of gratitude, joy and satisfaction at the way in which God has blessed the work of our missionaries. We are blessed to have reached the harvest time and see the fruits being gathered therefrom. In the Gospel of the Mass that day we heard Christ tell his disciples, “Blessed are the eyes that see what you see, for I tell you that many prophets and kings wanted to see what you see and never saw it; to hear what you hear and never heard it.” I was privileged to be in Ekiti representing the SMA to see and hear that wonderful things God has done there in the last 100 years. I am grateful for the opportunity I had to represent the Irish Province at the celebrations. I am very grateful to Bishop Ajakaye, Bishop Fagun, the priests and people of Ekiti for the really warm welcome I received. I also want to express my thanks to SMA colleagues, Fathers Edward Muge and Tim Cullinane and the staff and students of the SMA Formation House, Ibadan for their hospitality and kindness. [Editor’s note: Fr Corrigan humbly forgets to say that he was the man who, over several years, saw the acquisition of the site and built the Formation House in Ibadan]. The growth and development there is different but compares well with what I saw in Ekiti and gives us reason to be grateful for the past and to face the future with hope.